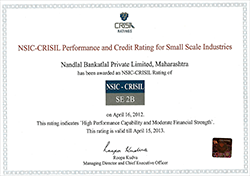 Based in Mumbai, India, Nandlal Bankatlal Pvt. Ltd. has been a major company in the market of Bulk Drugs, Macrolide Antibiotics, Vitamin E Natural Liquid, Vitamins and Sweeteners. As a key Manufacturer, Exporter, Supplier and Distributor, we serve the needs of both domestic and global market. With the expertise, facilities and trustworthy associates, we have been able to meet customers' demand for new, effective and improved products. Our motto is to do the best possible for satisfaction of the customers. We are helping in enhancing health through high-quality products. For instance, our Bulk Drugs, Macrolide Antibiotics, Vitamin E Natural Liquid feature precise composition, cost-effectiveness and proven results. Pharmaceutical, medicine, food and cosmetic are some of the industries we serve.